Microwave instruments are particularly suited to observing the polar regions, since they do not rely on illumination from the Sun, so can continue their observations during the dark winter months. Passive microwave radiometers, such as AMSR-E on NASA's Aqua satellite, measure microwaves emitted from the Earth's surface. Comparing the microwave brightness at several wavelengths gives a measurement of the surface temperature, which can be used to detect and measure the concentration of sea ice cover. Passive microwave sensors have a broad area of coverage, with repeat imaging of any area every day, but a limited spatial resolution (the area on the ground represented by one pixel). Active microwave instruments, otherwise known as radar, can have a very high spatial resolution (small pixel size). They work by transmitting their own microwave pulses of a specific wavelength, then detecting the return signal reflected from the Earth's surface. By using the satellite's motion along its orbit to emulate a large receiving antenna, a very detailed image of reflected radar strength can be built up. This technique is known as synthetic aperture radar (SAR). Although detailed enough to show small ice features, these images have a smaller area of coverage than passive microwave sensors, with gaps between images so that a repeat image of the same area might not be possible for several days. Spaceborne radar was pioneered by NASA's experimental Seasat in the 1970s, and developed commercially by Canada's Radarsat in the 1990s. The European Space Agency's remote sensing satellites ERS1, ERS2 and Envisat have all carried SAR sensors. ERS and Enivsat also carry Radar Altimeters (RA), which use radar pulses to very precisely measure the height of the sea surface. Their precision is sufficient to measure the thickness of ice standing above the sea surface (freeboard). This enables ice volume to be estimated. Images from Radarsat have been used for sea ice tracking over the western part of the Arctic Ocean for the winters of 1996-2000 in NASA-JPL's Radarsat Geophysical Processor System (RGPS). 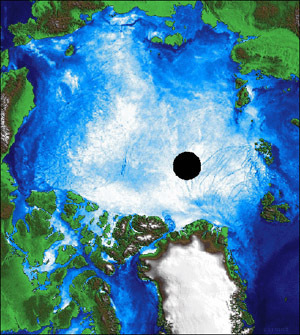 The GlobICE project develops the RGPS techniques for use with radar data from ESA's environmental satellites (ERS SAR and Envisat Advanced SAR) and applies them over the whole Arctic Basin.